"Everybody's children are so special. It makes you wonder where all the ordinary grown-ups come from." In the near future, knowledge of our genetic code influences every aspect of life, from traveling rights to the choice of a mate. Due to rampant cloning, it's possible your genetic code may be too closely linked to your lover, which would constitute a criminal violation. If the connection is greater than 25 percent, any attempts at reproduction would constitute a Code 46 violation. If finding a significant other wasn't hard enough already, the government has now added another tough element to the mix. While this process does improve the health of the species and create a purer society, it also disregards an individual's freedom to live unhindered. In today's ever-growing restrictive society of the Patriot Act and bans on gay marriage, these genetic limitations may not be as far-fetched as they seem. Code 46 presents a futuristic society that appears fairly similar to the present day. Unlike the frenetic worlds of such recent big-budget epics as Minority Report and I, Robot, this story presents life in a more realistic fashion. Humans still drive the typical cars and ride old-style escalators, and clothes seem pretty much identical. The solid-color jumpsuits typical in cheesy science-fiction efforts do not exist here. The atmosphere is depressing, though, as the people act like automatons and receive little joy from their lives. Even a nightclub scene feels muted and lifeless, as its participants go through the motions but lack the energy to truly enjoy it. This saddening tone makes it difficult to immerse ourselves in the story, but it does correspond well with the major events that occur. Samantha Morton stars as Maria—a creator of 'papelles,' the travel permits necessary to move freely throughout the world. Through a forgery investigation, she comes into contact with William (Tim Robbins), an investigator for the government who appears to possess an intuitive sense about people's secrets and learns them by asking only a few basic questions. 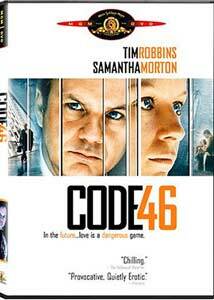 They quickly connect and fall in love, and the lengthy descriptions of Code 46 in the film's prologue make it very clear what obstacles will arise in their relationship. The oppressive government—known as the Sphinx—also has the ability to remove your memories about the Code 46 incident. When William returns for another investigation, Maria has no memory of their encounter. His efforts to regain her love could be successful, but they also risk interference and possible exile from his superiors. A majority of the film takes place in Shanghai, which appears impressive in an architectural sense but is also lifeless and cold. The citizens who have been approved by the Sphinx live in relative comfort, but many have been exiled to the harsh conditions outside. Life doesn't appear too bleak, however, as people may journey to "free ports" where the government lacks complete control. The ports' affiliation with the Sphinx is never explained, so their apparently revolutionary aspects remain unclear. Marcia and William's relationship might be doomed even within these more friendly confines. Is there any hope for victims of Code 46? Tim Robbins and Samantha Morton are both accomplished actors who have delivered lively, award-winning performances in recent years. Each has their moments, but they both fall victim to the machinations of the script. Robbins is especially uninspiring, as he overdoes his character's boring persona and fails to make him compelling. His best moments involve attempts to use his knowledge of people to gain an edge, but even that skill becomes tired during the story's later stages. Morton was enchanting in In America and Minority Report, and she generates a similar charm at times, but it fails to overcome the overall shoddy, slow pace. British filmmaker Michael Winterbottom has crafted some of the more original films of the past decade, including the energetic 24 Hour Party People and troubling Welcome to Sarajevo. He often utilizes a deliberate tone to involve the audience in the environment, but few are as difficult as Code 46. The setting offers the possibility of a fascinating exploration of genetic issues and personal freedoms, but instead the director and his frequent writer Frank Cottrell Boyce focus too much on the romantic aspects. The detective story and interaction between the lovers could take place in almost any genre, and this universal tone damages its impact. The story includes genuine moments of human interest that fall between some lifeless and yawn-inducing storytelling. Winterbottom provides an impressive visual style that holds your attention for a considerable time, but it cannot carry the plot on its back. It ranks as a notable failure that makes you think for a while, but fails to grab you enough to warrant extra consideration. Image Transfer Review: Code 46 may lack the majestic visuals of some big-budget science-fiction films, but it still provides an impressive viewing experience. The 2.35:1 anamorphic widescreen transfer showcases the fairly bleak, cold atmosphere in effective fashion. Few defects appear on the transfer, and the colors are sharp and distinctive. The black levels are solid, and the overall presentation is consistent throughout the picture. Audio Transfer Review: This release offers a decent 5.1-channel Dolby Digital transfer that nicely conveys the distinctive original music from Joshua Hyams and Mark Revel. The overall movement around the sound field is good, but it could have provided a slightly broader experience. Much of the story presented is dialogue, and the words do come across clearly. Any difficulty in hearing the actors stems from the subdued performances of Robbins and Morton. Although it lacks the extra touches inherent in the best transfers, this audio track still works well enough to deserve a recommendation. Extras Review: Considering the wealth of possibilities for discussion on the issues presented, the lack of significant extra features is extremely disappointing. Obtaining Cover provides a glossy 17-minute overview of Code 46 and includes interviews with all the key figures. Unfortunately, it contains far too many clips and offers only a few worthy elements. I would have enjoyed a more serious look at the low-budget production and guerilla filmmaking tactics used by Winterbottom. Instead, we receive a dull retread of the basic plot aspects. This disc also includes four deleted scenes that run for about two minutes. Without any explanatory commentary, these moments have no context of any kind. The remaining supplements include a plethora of trailers, with a special five-minute sneak peak of Species III. Even given its B-movie nature, this movie still looks like an awful piece of work. The preview for Code 46 also appears here, and it almost completely misrepresents the story. Code 46 introduces numerous worthy ideas concerning our genetic future and the growing restrictions placed on citizen's lives. But it fails to truly explore these issues and instead focuses on a less-compelling romantic story. Science-fiction fans should at least draw some minor interest from this film, but it falls short of offering a truly memorable experience.